The Bottom Line: Fresh, fast and furious. 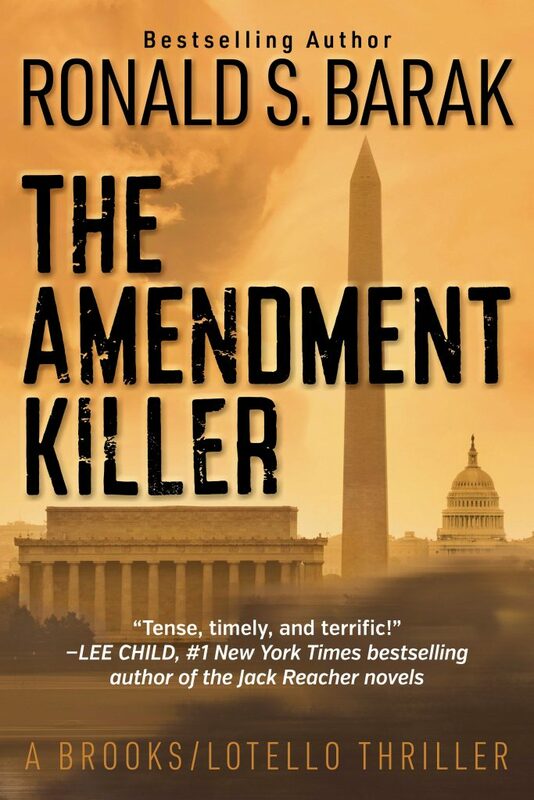 The Amendment Killer is one of the year’s best legal thrillers. Fans of Scott Pratt and Lisa Scottoline may find a new favorite author in Ron Barak. Set among the hallowed chambers of the Supreme Court of the United States, Ron Barak’s new thriller begins as Thomas T. Thomas III stalks Justice Arnold Hirschfeld’s granddaughter. Kidnapping eleven-year-old diabetic Cassie Webber isn’t going to be easy. Compared to Thomas’ childhood, Cassie leads a privileged life, including door-to-door transportation to school by her doting parents and twice-a-day private golf lessons. Barak has devised a kidnapping that is anything but ordinary. There’s no demand for money. Instead, Thomas wants to sway Hirschfeld’s critical vote on the Supreme Court’s determination of the validity of 28th Amendment to the U.S. Constitution – one that would criminalize abuse of political power. And if Justice Hirschfeld doesn’t comply? Thomas won’t kill the girl. He won’t have to. He’ll simply deny the diabetic youngster the insulin she needs to live. With that, Barak beautifully sets the stage for a high-stakes legal thriller that is easily the best we’ve read this year. Former courtroom attorney Barak, who is also diabetic, expertly tells the story from alternating points of view. While Cassie’s chapters are as gut wrenching as you might expect, it’s Thomas’ that are the most effective. His sense of entitlement, envy and fanatical obsession with protecting his country are delightfully disturbing. Barak could easily have chosen more obviously explosive legal topics, such as Roe v. Wade, or a contested presidential election. His decision to aim for more intellectually stimulating fare is refreshing, and by the time the final page is turned, readers will have learned a lot about why the issue is so important. Highly recommended.